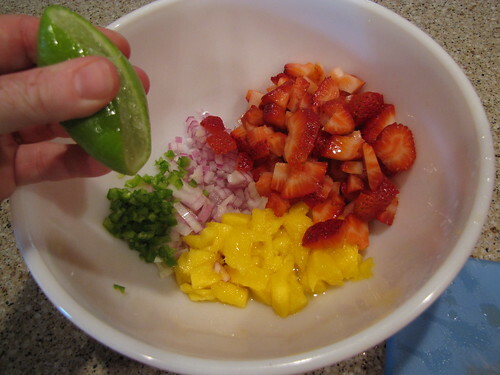 I was going to wait to publish this recipe because we just had Pineapple Salsa a week or so ago. 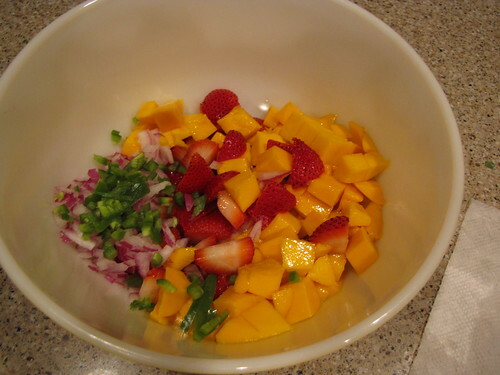 Strawberry Mango Salsa is quick and easy and like our other funky salsas, it’s great on just about everything. 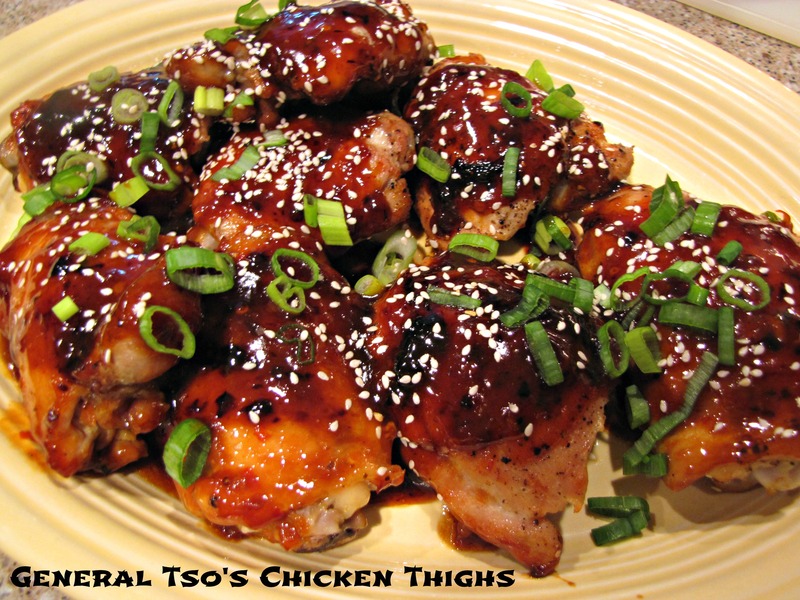 I put it on fish, but you could also add it to some grilled shrimp or chicken, have it as a side salad, or just bust out the chips! 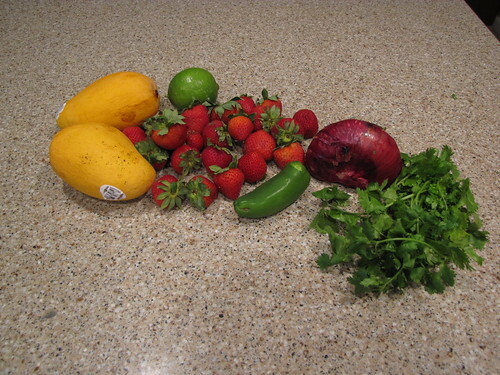 Strawberries, Mangoes, Jalapeno Pepper, Red Onion, Lime, and Cilantro. If you can find the small yellow Honey Mangoes, grab them while they’re in season. They’re SO good…smaller and sweeter than the regular mangoes. 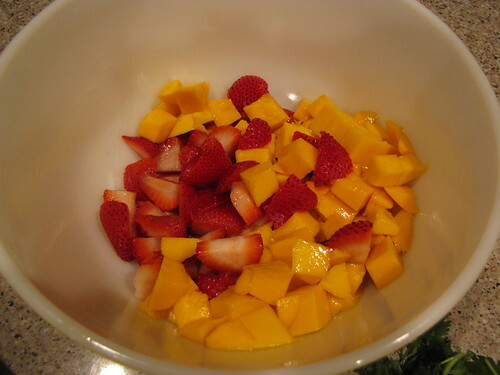 Slice 1 pint of fresh strawberries and add them to a bowl. Cut discs off the sides of the mango so you cut the fruit away from the oblong pit. Score each slice on the fruit side into squares, turn it inside out, and cut off the squares. If you need good mango cutting instructions and step by step photos, CLICK HERE. Chop up the green stuff! 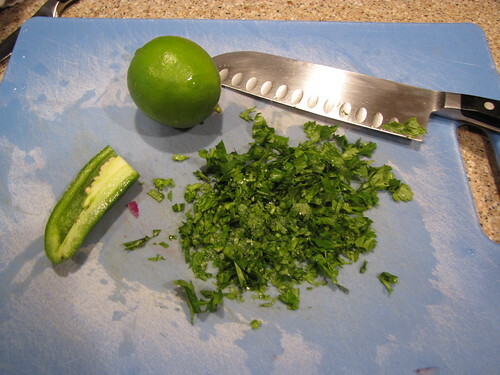 I have about 1/4 cup of cilantro, half a jalapeno pepper that I will take the seeds out of so it’s not too hot, and 1 lime for juice. Finely chop 1/4 cup of red onion (about 1/4 of a medium onion) and add it to the bowl. Add the cilantro and gently stir to combine all of the ingredients. 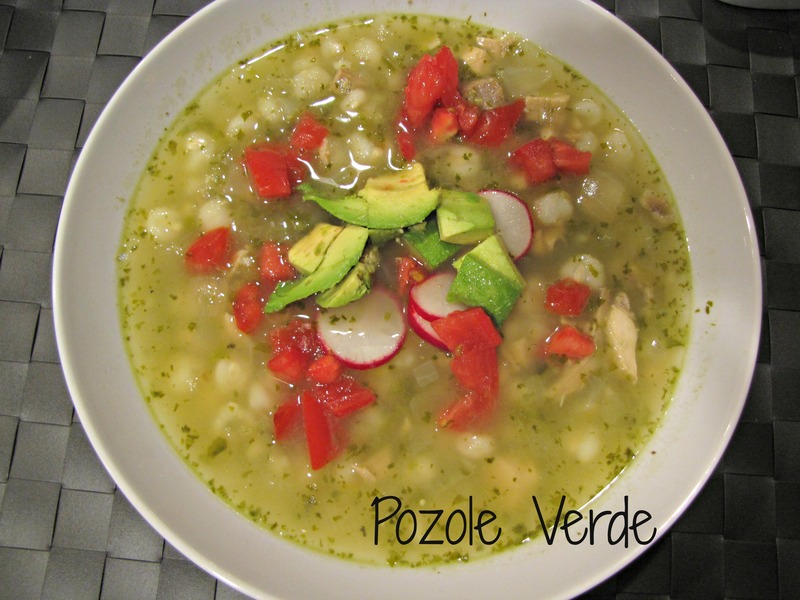 Give it a taste and decide if you need a little more lime juice. Then I ate the entire rest of the bowl of salsa with a fork! 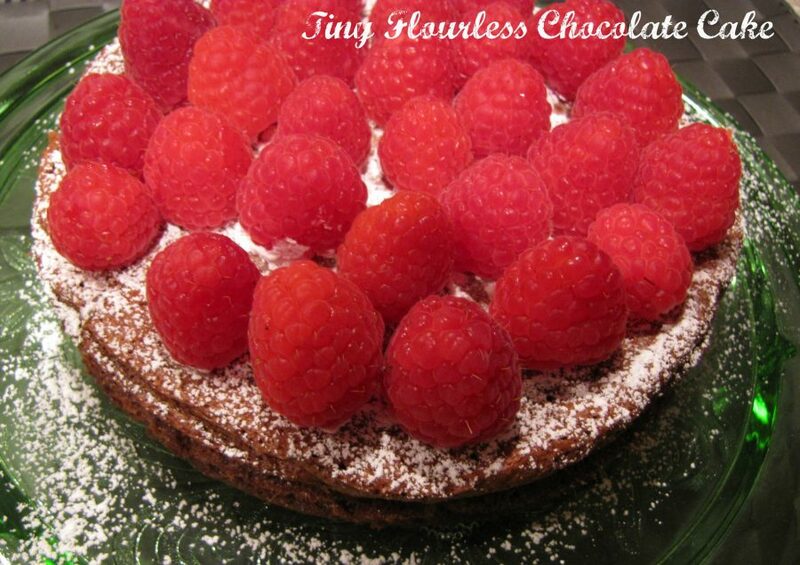 Get on this while all the ingredients are fresh, ripe, and available. 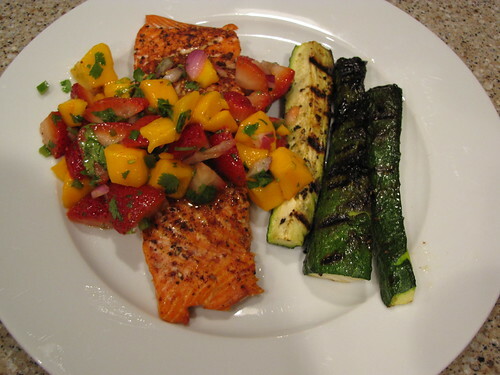 Salsa is one of my favorite dishes….whether with fish or alone! 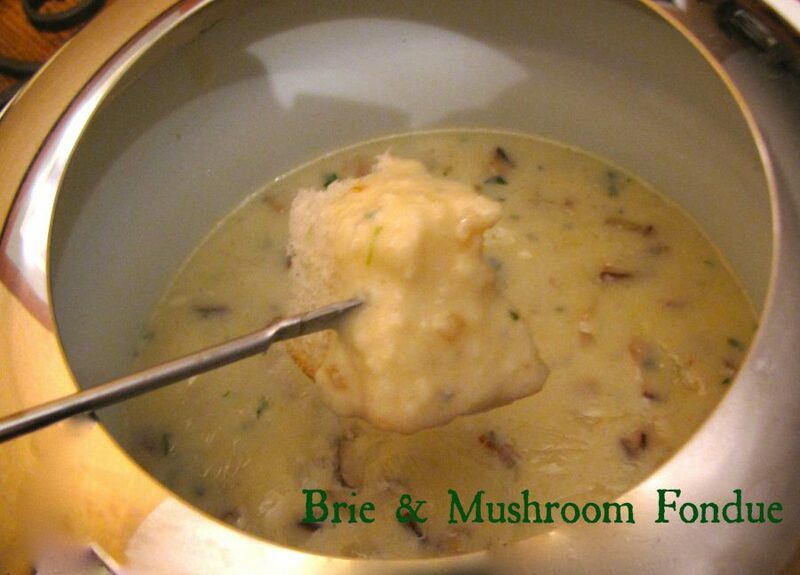 This looks delish and I’ll try it this summer! Yum! 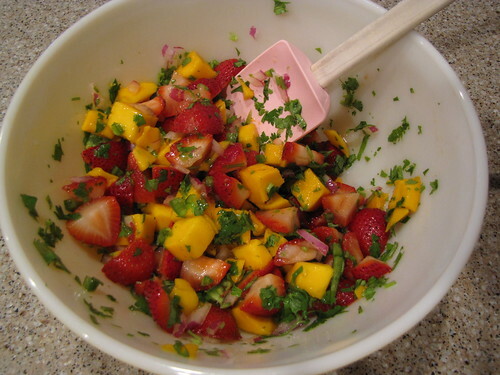 I make mango salsa that is very similar to this, but I add red bell pepper. I never thought of adding strawberries. Genius!